Chris Plys says he is happy he can experience his first Olympics with his father and other family members. Vancouver, British Columbia (CNN) -- Chris Plys is like most 22-year-olds. He loves to use Facebook, Twitter and MySpace, loves his iPhone, loves listening to all types of music, loves hanging out with his buddies at night shooting pool. And he loves his folks. 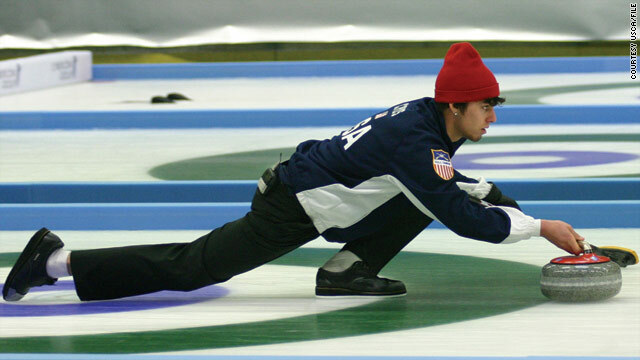 That's why when he made the U.S. Olympic curling team, it was especially important to find a way to make sure his parents could come see him at the games, even if he might not play. It is his first Olympics, and he wanted them to share it with him. Every dollar helps, and it's not like curlers are pulling down seven figures. So when Plys found out about a reality game show on the E! network called "Bank of Hollywood," he was all about getting some cash for his parents. On the show, contestants ask a panel of four celebrity judges to donate money for their causes. A friend helped him put together a video. They sent it in to the show's producers, and he got the call. Well, he got a bunch of calls, one a week, until the "You made the final cut" one came in. He didn't tell his parents about the show. They only found out when a TV crew came to shoot a background video at their home. "I kind of wanted to have a surprise to give them," he said Tuesday in between curling matches at the Vancouver Olympic Center. "They were super happy [when he was awarded $6,500 by the judges]. They have been through a lot these last few years with the whole thing with my dad's health." Plys father, Patrick, was diagnosed with brain cancer in 2007, and Chris immediately thought about not playing. But Patrick assured his son he would be fine. "You can either be scared to death, or you can take every part of your being and your spirituality and fight as hard as you can" Patrick Plys told the Star Tribune of Minneapolis in January. "We as a family had a great support network around us with our church community and our friends, and we were going to fight." Before Chris would go on the road to a tournament, Patrick would write him a letter, and Chris would keep it in his pocket when he played. When Chris led the U.S. team to the world junior championships in 2008, Patrick was unable to go to Sweden because of his treatment. Chris Plys said a friend helped set up a Web cam to broadcast the matches so his dad and others back home could see the results. Knowing his dad could watch was an inspiration. "It motivates you because I felt like I was also playing for him," Chris Plys said. He still does. Patrick was pronounced cancer-free a few months ago and is in Vancouver supporting his son. Chris Plys' appearance on "Bank of Hollywood" helped more than just his family. It helped him get noticed by people who never watch curling. Then again, it's pretty easy to notice the 6-foot-1, lithely built Plys. One member of the game show panel, singer Melody Thornton of the Pussycat Dolls, asked him on a date while another, Wilhelmina agency President Sean Patterson, said Plys should consider modeling. Plys, though, is much more interested in a musical career. Back home, he plays gigs with his band. Asked to compare himself to a popular singer, Plys said his sound is like John Mayer. His look is, too. Plys brought his guitar to the games, and the other night was pleased to tweet that he was on the penthouse suite of a building in the Athletes Village, strumming out some tunes. He said he might pen a song while he's here. "I was plucking away last night, writing a few things down," he said. "I'm definitely going to try to have a song written by the end of the Games." He's not opposed to making appearances in front of the camera, though. Since he has been here, he's taped segments for MTV and an NBC Olympics feature. It's all for curling, he says. "It's starting to get a lot bigger because a lot of people are starting to see that I don't look like a typical curler, especially off the ice," he said. Then he laughed while recounting how people in the village have mistaken him constantly for a snowboarder because of the way he dresses and wears his hair. Twitter also helps promote the sport -- "For me, it's blown up," he said -- so Plys tweets from his spot as an alternate during the matches. The first day was a battle against nerves for the team, he said. The U.S. lost to Germany and Norway. As for him, he'll stay focused, he said, ready to help in any way he can. That is his nature, after all.